This 3-mode, grounded hammer is great for mid-size hole drilling (up to 1-1/8 in. diameter) in concrete. The D-style rear handle offers the operator a secure comfortable grip and a two-finger speed control trigger switch. Speed control allows smooth controlled starts and less bit walk for accurate hole positioning. The hammer accepts SDS style bits up to 1-1/8 in. diameter. It can drill up to 3-1/2 in. holes in concrete using thin wall Core Bits. A hammer-only mode allows this tool to be used for light chipping work. A slip clutch stops rotary action when a bit jams protecting the mechanism from overload. The tool can be set for a rotation-only mode for drilling in steel or wood. A 3-jaw chuck adapter kit 48-66-1370 is available. Three modes of operation: rotation with hammering, hammer-only and rotation-only. 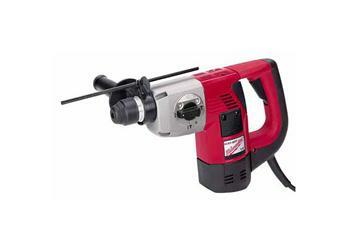 This versatile tool can be used for drilling in steel, wood or concrete. Use rotation-only for drilling in steel and wood with optional chuck and adapter. Use rotation with hammering when drilling in concrete. Use hammer-only for light chipping work. Thin Wall Core Bit Capacity 4"